one of my favorite lanni cards to play in a trait deck, you want a knight, army, lord? they got you. So long as you have another character with the trait you need of course. 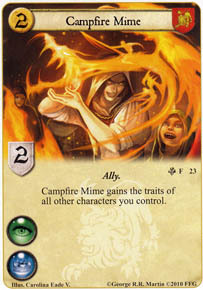 But when you are rewarded by having multiple characters of a certain trait, Clansman and Maester being the most useful in Lannister (IMO of course), they are a good card.